Spiders and bots can take up a lot of bandwidth crawling the site, and at times it is important to block them. The AmeriCommerce online stores feature a whitelist and blacklist functionality, which is a huge help when being targeted. Description [Deny] - Use this option to block an IP address or range of addresses. Description [Allow] - If you denied a range of IP addresses ,this will override it and allow a specific IP address through. CIDR Notation - An alternate method to block a range of IP addresses without using wildcards. The AmeriCommerce system can allow or block in three different ways. 139.130.4.5 is a viable IP Address. 139.130.4. * is a viable range. An IP Range using CIDR Notation. 139.130.4.1/32 is a viable CIDR Notation range. Using CIDR notation is outside the scope of what Support can help with, but you can begin learning by visiting its Wikipedia entry. To begin, log into the admin panel. After logging in, go to Setting > Security > Firewall/Access Control. Here you can Edit an existing entry, or create a New entry altogether. If you want to deny an IP address, then you will want to set the description to Deny. 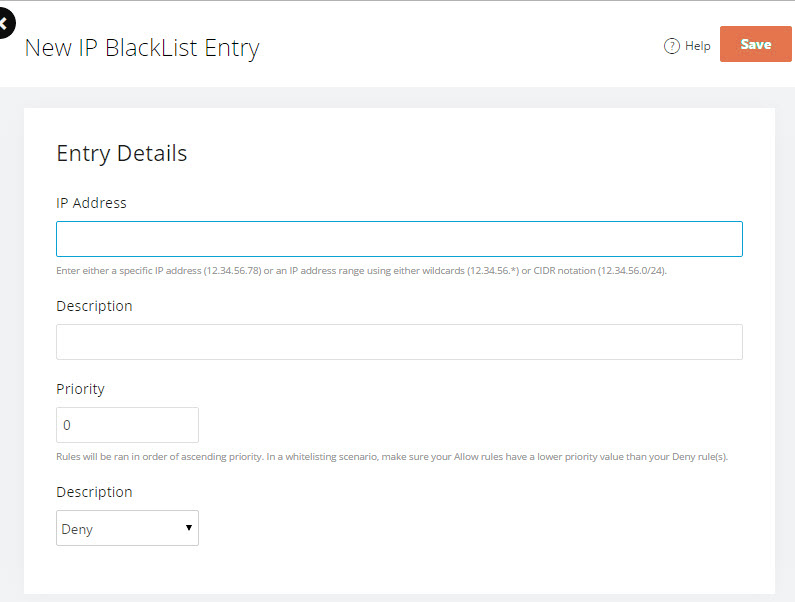 Then, set the IP Address in the top field for addresses you want to block. You can have a specific IP Address here, a range of IP's using a wildcard, or CIDR notation. Next, input a Description so that you can know what is being blocked. For the Priority, you will want to set this to 1 or greater. If set to 0, then it will not be possible to override the list, allowing a specific IP Address through. Allowing an IP Address is similar to blocking. You will want to set the description to Allow. Next enter the allowed IP address. Set the Priority to 0, and click Save. After saving the IP address entry, you can later edit the entry. There will be a set of statistics at the bottom, displaying information. Things such as how many HITS this IP address range has had, the most recent hit, and what the User Agent of the IP Address is. Thanks for fixing this! I am running into an issue of MAX length in the database of 15 characters. I can't block using 220.181.108.1/24 because it is greater than 15. Any fix for this?